YouTube/DoritosDoritos and Mountain Dew go head to head in Pepsi Co’s Super Bowl ad. Fans are going crazy for PepsiCo’s Super Bowl commercial which shows two of its most popular brands, Doritos and Mountain Dew. It has over 10 million views online, according to iSpotTV. The ad shows ad Peter Dinklage and Busta Rhymes teaming up in a singing battle against Morgan Freeman and Missy Elliot. 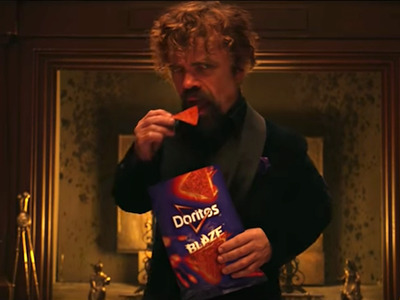 PepsiCo has struck gold with this year’s Super Bowl ad for two of its best-known brands, Doritos and Mountain Dew. The commercial, which shows Game of Thrones actor Peter Dinklage and rapper Busta Rhymes teaming up in a singing battle against actor Morgan Freeman and rapper Missy Elliot, has more than 10 million views online and is the most shared ad on social media, according to iSpotTV. NBC is reportedly charging $US5 million per 30 seconds of commercial showing time, which means that Pepsi Co would have spent around $US10 million on this minute-long ad. But it’s a stroke of genius: by advertising two brands in one commercial, the company is killing two birds with one stone. The ad also represents a comeback from Pepsi’s disastrous Kendall Jenner commercial in April 2017, which showed the model giving Pepsi to police and protesters amid a national controversy over police brutality. Pepsi pulled the ad.